Over the years, computers have become an integral part of education in the developed world. But what of schools in less wealthy areas that lack access to electricity, not to mention the cash for pricey electronics? The solution may come in the form of a $50 handheld electronic tablet, dubbed the I-slate. 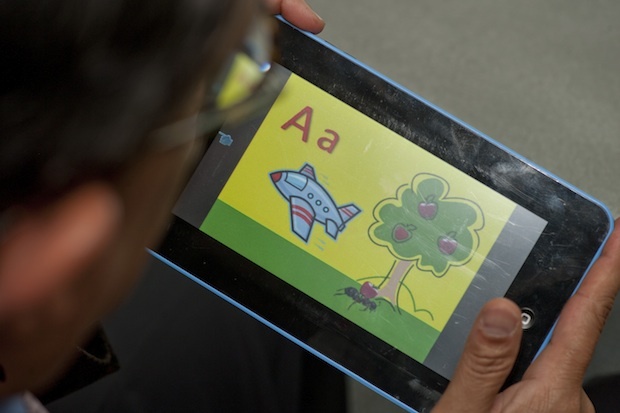 The device, developed by the Institute for Sustainable and Applied Infodynamics (ISAID), is essentially a electronic version of blackboard slates used by Indian children. Over the past year, the I-slate was tested with children ages 10 to 13 in a village outside Hyderabad, with impressive results. Researchers looked at whether the I-slate, which allows students to write out math problems and get feedback about their answers, improved math skills. Now that ISAID has proven that the device improves education outcomes, the organization is working on a production version of the I-sate. The tablet will be solar-powered (with panels similar to the ones found on handheld calculators) and will feature a low-power computer chip designed by Palem. The solar-powered I-slate will go into production next year. In the meantime, 50 students in Mohd Hussainpalli and nearby villages will receive battery-powered I-slates in the fall for a six-month trial. Whether the I-slate will expire after three years of use or so (like so many computers and tablets) remains to be seen. Regardless, the device’s low price tag makes it a worthy experiment.